I often talk about that wise SVP that I met in the Arts hotel of Barcelona. I’ll jump ahead of the story and let you into a little secret. He didn’t have a clue either. However, I didn’t find this out until 2011. I had always assumed that there was some secret tome but it turns out that much of industry is fighting battles with a poor understanding of landscape. It’s like generals fighting without maps. It boils everything down to luck and individual heroism. When I discovered this, I started to question the trove of business strategy books in my small library. I had an onerous task of going through it all and categorising individual pieces as doctrine, climatic pattern, context specific or just plain luck. These days, when someone tells me they know strategy then I ask them for a map of their business. If they can’t show me it, then regardless of their claims I take a skeptical position. They probably don’t know as much as they hope they do. They might even be more dangerous than this as it’s rarely the unknown that gets you but what we think we know but don’t. 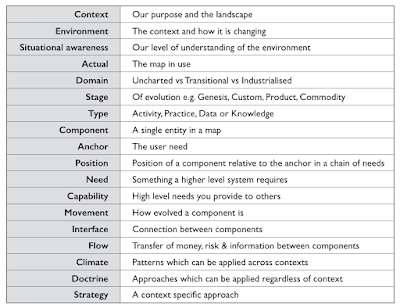 This doesn’t mean I think people are daft but instead that understanding your landscape, the context that you’re competing in and having a modicum of situational awareness is not a luxury for strategy, it is at the very core of it. Inspiring vision statements, well trained forces, a strong culture and good technology will not save if you fail to understand the landscape, the position of forces and their size and capabilities. Colonel Custer is a worthy lesson here and even he had maps which were better than most corporates today. I've seen billions wasted by companies that have charged into battles that they have no hope of winning. I've seen endless SWOT diagrams, stories and other magic thinking used to justify such actions. I've also seen others tear apart industries with ease. The importance of aptitude. The biggest battles require a multitude of aptitudes from damage (those who do our spanking usually from range) to tanking (defensive protection) to healing (those tanks get spanked a lot and need healing) to crowd control (those mage sleep spells aren't there for just looking at). The way you play and how the roles are deployed depends upon the scenario. Of course, without situational awareness then you're at a huge disadvantage as you can often turn up with precisely the wrong sort of forces. The importance of team play. A multitude of roles requires team play which means communication, co-ordination and acting in the interests of the team. The importance of preparation. There's no point turning upto the fight with an assortment of weapons if you don’t know how to use them. The largest guilds in some of these MMORPGs have many hundreds to thousands of players supported with extensive wikis, communication mechanisms, training and development, tactical game plays, UI engineering, structure, leadership, specialist cells and information systems. So, how does an MMORPG compare to business? In general, we don't have maps. Most companies suffer from poor situational awareness being caught out by predictable changes. 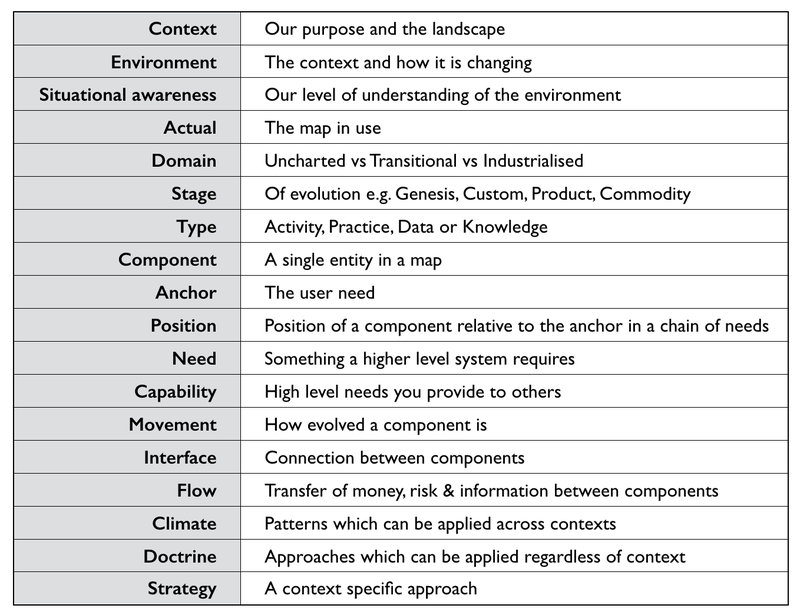 The most telling factor here is that business strategy is normally a tyranny of action - how, what and when - as opposed to awareness - where and why. On the whole, we do a bit better at recognising that multiple aptitudes are needed. However, we often fall down by not considering attitude, the context and isolation (operation in silos). We certainly try when it comes to team play, often having team building exercises which can be a bit hit or miss. We also tend to complain about communication despite the plethora of tools available. This can usually be traced back again to poor situational awareness - if we don't know the landscape and fail to create a plan of attack based upon this, replacing instead with vague notions of vision or a story then it becomes difficult to communicate how things are actually going. It’s far better that the question “Where are you” receives a response of a co-ordinate on a map than a response of “I’ve just walked along a path, I’m by a tree and I can see lots of orcs”. In fact, abundant communication mechanisms rather than efficient communication can itself become a problem without good situational awareness as new players constantly ask “where should we go” as they run around in a daze. This can take up valuable time from other team members and weaken your overall strength. Preparation itself is almost non-existent in corporates. In some areas we might attempt scenario planning and a few exec games about imagining you're a startup trying to disrupt your business but on the whole we're often so busy with immediate work such as firefighting and keeping up with competitors that we create little time to prepare. There's an awful lot to be said for learning about these aspects from online games. Anyone under the illusion that business is some bastion of strategic play should spend a few minutes watching an experienced group run an organised raid. Those people tend to use levels of strategic and tactical play that businesses can only dream of. Fortunately, in business we're often up against other organisations that equally lack situational awareness, suffer from isolation, have weak team play, ineffective but abundant communication and lack preparation. The effect is somewhat remarkably similar to a group of inexperienced World of Warcraft players just charging at each other with cries of "Attack" followed by "Will someone heal me!" An exciting brawl of chaos with often single participants - hero players, the Steve Jobs of your Elven army - making the difference. Of course, face either team or in fact both teams against an experienced and well-rehearsed group then it stops becoming a brawl and starts becoming a massacre. Opposing healers get wiped first, followed by crowd control, tanks and then poor and undefended damage dealers. In the world of business, there are some really dangerous groups out there. Don't expect to go up against them with the usual 'Here’s the vision, we’ve got great people … now Charge!' approach. It’s far more sensible to find a profitable exit in order to fight another day. That's a hint to those gaming companies starting to be concerned about Amazon's encroachment into their space with Lumberyard. Either start learning from your own online players or find a new industry to bunker down in. Finally, don’t expect to just to read a few chapters on mapping or play a couple of games and an instantly transform into a master of strategy, there is a long journey ahead of you. Finally, I don’t care that you’ve been doing strategy for several decades. Show me a map first. All models are wrong; some are merely useful. Mapping is not the answer, it’s simply a guide. Hence don’t try to create the perfect map, the key is to produce good enough and this requires you to share and open yourself up to challenge. Also, you’ll likely to use other tools alongside mapping when scenario planning and examining the viability of different points of attack. This can include financial models to my current favourite of business model canvas. When thinking about strategy, the first thing you need to do is identify where you can attack before why here over there. It’ all about position (y-axis) and movement (x-axis). The entire strategy cycle is iterative and you’re going to have to follow the same path. Which means mapping is not going to be a one off exercise but something that happens all the time. Again the temptation is to map the entire landscape in some sort of “deathstar” – large scale, all encompassing, doomed to fail – effort in order to create that perfect answer. Instead you have to embrace the uncertainty, think small and start somewhere. If you’re using mapping, it’s taking a long time and doesn’t seem to help answer any questions, then stop. Don’t be afraid to find a better way of doing this. If you are responsible for strategy, then you need to learn to play the game yourself. I often give strategy consultants a hard time but this doesn’t mean they don’t have a use. Don’t however rely on third parties to give you an answer, instead use them to help you challenge your strategy and to learn new forms of gameplay. 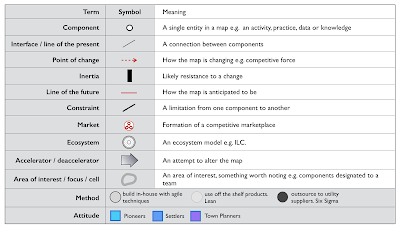 There are numerous terms associated with mapping. I’m often guilty of using them without clearly explaining to others, so in order to rectify this I’ve provided the most common in figure 52. Maps are obviously visual and whilst they are far from the ordinance survey maps of geography, it’s useful to have a common lexicon of symbols. In figure 53, I’ve provided the ones I most commonly use. The original terms were Innovation, Bespoke, Product (+rental) and Commodity (+utility). The problem with this was confusion over the term innovation. 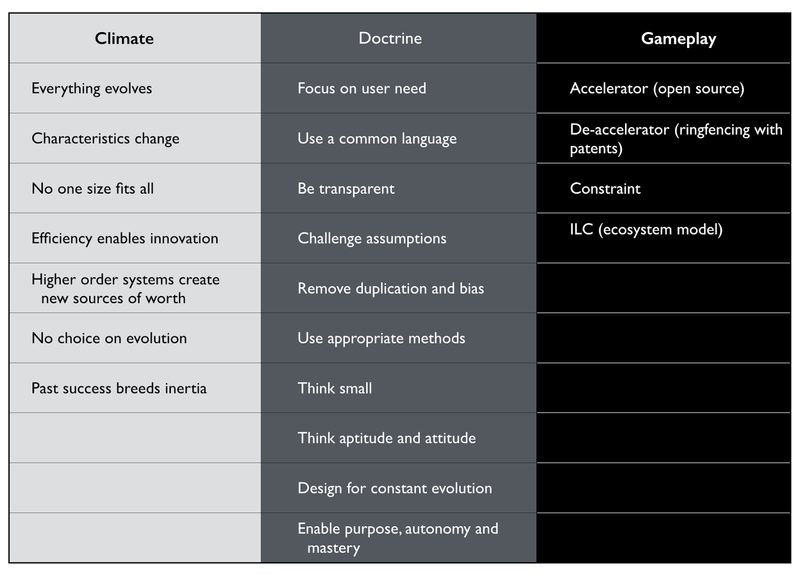 An innovation is simply the first(ish) attempt to put an idea into practice but this can mean the genesis of a new thing or a feature differentiation of a product or a shift in business model from product to utility. To clarify I used the term genesis instead as in the first attempt to create an act, a practice, a set of data or a type of knowledge. The original term was … blank. I didn’t feel the need to spell it out but it became clear that I needed to after being asked many times “What does the Y-Axis represent?” Hence, value chain and the marks for visible & invisible were added. The original terms were chaotic and linear. However, this created some confusion with mathematical terms and wasn’t very descriptive. Hence I replaced it with uncharted and industrialised. The original terms were development, framework and systems which became pioneer, coloniser and town planner as the business was folded into the structure. However, coloniser never really stuck and it morphed into settler over time. 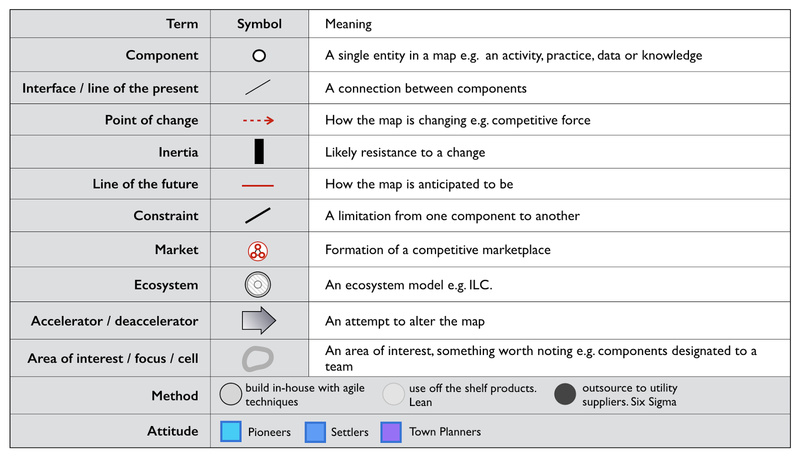 Most organisations have structures in place that can be used to embed mapping whether it’s an architectural group or an office of the CEO or a business relationship function or some other home. 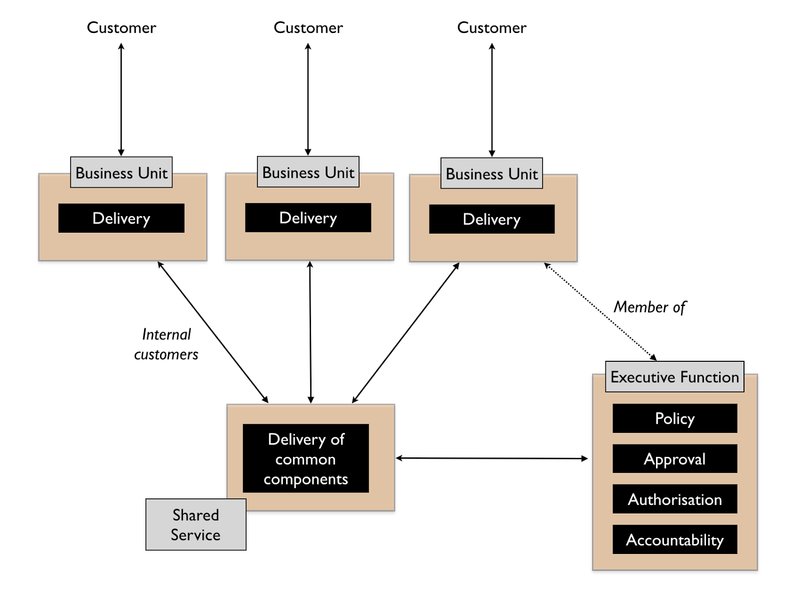 Typically, in a distributed organisation then you normally have the business units that are responsible for delivery, some form of executive function that covers policy, approval and accountability and a common or shared services supply group that provides some element of commonality as per figure 54. However, the common components provided are often a bit hit or miss. Without a form of mapping then it’s difficult to find what is duplicated and how it should be provided. It will often degenerate into plucking things from the air. There also tends to be an element of political conflict between the business units and the shared services and in the worst cases the shared services function can be viewed as a hindrance. To resolve this, we need to separate out the delivery of shared services from the identification of what is common. I’ve found the best way to achieve this is not to remove budget from the business units (often a political bone of contention) but instead to introduce a co-ordination function. The role of the co-ordination function is to encourage compliance to policy (doctrine) often via a spend control mechanism and to enable sharing between the business units through the use of maps. This doesn’t require some big bang overhaul but usually the formalisation of an existing structure e.g. Office of an executive function or an architectural board into this role. When spend control is used then a policy limit (e.g. £500K) should be set above which any project must be mapped and the map sent to the co-ordination function. The function can then analyse the map, make recommendations and introduce elements of transparency and challenge within the organisation. As more maps are gathered then the function can also identify patterns for common services. This should become a relatively quick process lasting a few hours from initiation to recommendation. It’s through such a function that other forms of doctrine such as cell based structure, use of Pioneer-Settler-Town Planner along with more context specific gameplay can be introduced into the business units. I’ve summarised this in figure 55, adding in the co-ordination function (point 1). I’ve also noted that your shared service (point 2) should be elevated to a business unit and not just limit itself to provision of common components within a federated organisation particularly if you intend to run an ecosystem model such as ILC. If it’s important enough for you to create a shared and common service, then there either exists an outside market opportunity or you’re just rebuilding what already exists in the market. Over time, your shared services group is likely to become dominated by small cells of town planners providing industrialised components. Your business units will tend to become dominated by cells of pioneers and settlers providing custom to product and rental services. Your co-ordination function will mainly become settlers focused on ensuring transparency and learning within the organisation itself. However, this is over time. To begin with, simply start with a small co-ordination team (a handful of people) helping other business units create, share maps and learn from them. You will probably find that some business units start to offer their own home grown capabilities as common components to other business units. Don’t discourage these emergent behaviours. Whilst there may be an element of opportunistic “empire building” involved, if units are sharing and learning from maps then this is supportive. You can always migrate those components to a shared services group at a later date. The one thing to be careful of is business units trying to subvert the process e.g. trying to find exclusions to sharing or spend control. Often some will claim they are “too busy to write a map” or “it’s too complex”. For me, the idea that someone could be willing to spend £500K on something they can’t map sets alarm bells ringing. For such an expense we should know what the user needs are and what is involved. Mapping provides us the means to reflect on this, to challenge the assumptions, to question what is being considered and to demonstrate we have thought about it. Be warned however, these excuses are often code for resistance to sharing due to concerns that it will reduce their power base within an organisation. Knowledge is power often translates to shared knowledge is less power for me! If you ever want to stop the self-harm that occurs in corporations from the endless duplication and bias to the poor gameplay, then you need to counter this with force. However, check for yourself first. Despite arguments that you’ll hear that “we have architecture groups” or “good communication” just look around. Most federated organisations have hundreds of duplicated examples of the same thing being built. Ask yourself, how many pet IoT or AI projects doing roughly the same thing are actually going on in your organisation right now? If you're of any size the answer is "don't know" and from experience, it's going to be vastly more than whatever number you just thought of. Without a communication tool such as mapping and some form of co-ordination function then you’ll unlikely to find out. Any resistance to sharing requires you to wield the stick not the carrot with ferocity otherwise others will clamour for exclusions, protection of silos and sharing will be lost. Organisations tend to be full of corporate antibodies that will try to kill off any change to existing structures. To the question, shouldn’t the co-ordination function be part of the executive function then I’d answer yes. In my company, the co-ordination function was the executive team. In a larger company you might want to start with a separate topographical intelligence function. Remember, you are unlikely to have any maps of your landscape and your SVPs / VPs won’t be able to magic them out of hand. They’ll need support and help. This entire book is a process of continuous learning, however it’s more important for me to demonstrate how to achieve this (the strategy cycle) rather than the specifics of particular patterns. Once you have the basics, you will learn the patterns for yourself. However, it’s also worth me recapping as we go along this journey. In figure 56, I provided the basic patterns so far examined. I’m a great believer in using anti-patterns to examine the effect of not doing something. In this case, what are the anti-patterns for not mapping? In general, they will be the reverse of the doctrine that is developed from mapping along with a failure to cope with climatic patterns and incorrect use of context specific play. We can use this to describe what an organisation that doesn’t understand its landscape looks like. I often use this as a way of analyzing competitors but be careful, there’s a whole topic of misdirection that we haven’t touched upon yet. The anti-pattern organisation will look something like this. Fails to focus on user needs. Has an inability to describe its user needs and often confuses its own needs – profitability, revenue, data acquisition – with those of its user. Fails to use a common language. Uses multiple different ways of describing the same problem space e.g. 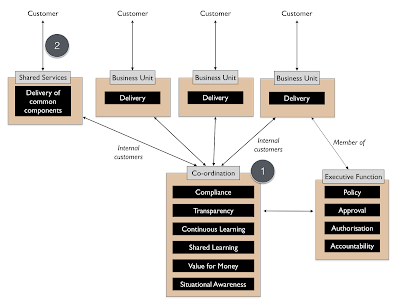 box and wire diagrams, business process diagrams and stories. Often suffers from confusion and misalignment. Has difficulty in answering basic questions such as “How many IoT projects are we building?” Information tends to be guarded in silos. Action is often taken based upon memes or Hippo (highest paid person’s opinion). Often parts of the organisation will admit to building things they know won’t work. Fails to remove duplication and bias. The scale of duplication is excessive and exceeds in practice what people expect. Any investigation will discover groups custom building what exists at a commodity in the outside world, their very own Thomas Thwaite toaster. Often resistance is given to changing this because it is somehow unique despite any inability of the group to explain user needs. Fails to use appropriate methods. Tends towards single size methods across the organisation e.g. “outsource all of IT” or “use Agile everywhere”. This can often be accompanied with a yo-yo between one method (the old emperor) and a new naked emperor based upon its success in a specific example (outcome bias). Tends toward big scale efforts (e.g. Death Star projects) and big departments. This can include major platform re-engineering efforts or major re-organisations. Fails to think aptitude and attitude. Fails to design for constant evolution. Tends to bolt on new organisational structures as new memes appear. A cloud department, a digital department, a big data group etc. Fails to enable purpose, mastery and autonomy. There is often confusion within the organisation over its purpose combined with feelings of lacking control and ability to influence. Fails to understand basic economic patterns. Often conducts efficiency or innovation programmes without realising the connection between the two. Assumes it has choice on change (e.g. cloud) where none exists. Fails to recognise and cope with its own inertia caused by past success. Fails to understand context specific play. Has no existing language that enables it to understand context specific play. Often uses terms as memes e.g. open source, ecosystem, innovation but with no clear understanding of when they are appropriate. Fails to understand the landscape. 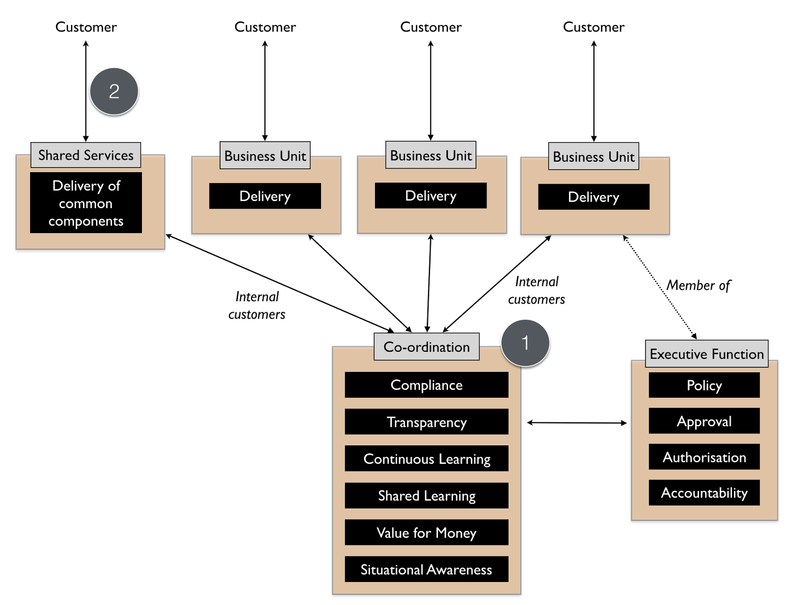 Tends to not fully grasp the components and complexity within its own organisation. Often cannot describe its own basic capabilities. Tends to be dominated by statements that strategy is all about the why but cannot distinguish between the why of purpose and the why of movement. Has little discussion on position and movement combined with an inability to describe where it should attack or even the importance of understanding where before why. Often strategy is little more than a tyranny of action statements based upon meme copying and external advice. There aren’t any books that deal with topographical intelligence in business that I’m aware of which is why after almost eight years of badgering I'm finally getting around to writing one. I'm a very reluctant writer and this is not a comfortable activity for me. However, there’s lots of other books that I’d recommend reading because of general concepts they provide. I don’t necessarily agree with everything that is said but these are definitely worth exploring especially because of later chapters in this book. I find that all of them are worth spending time with. Atlas of Military Strategy 1618 – 1878 by David Chandler. 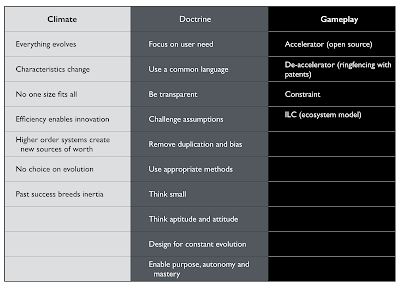 Diffusion of Innovations, Everett Rogers. However, before you start burying your head in books and I continue to writing. Can I strongly recommend that you go and play World of Warcraft if you have any doubts over the importance of situational awareness. I understand that Fernando Flores runs an executive training course on this.